Near the end of each year, I invite people on the Reading to Know Facebook page to suggest books for me to read during the following year. Whoever gets their comment/suggestion in first, wins and I read their book choice. 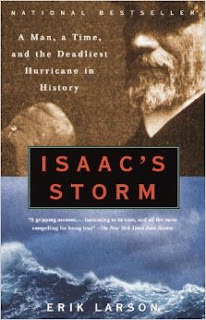 At the end of 2014 I invited four people to recommend books and Sandi T. recommended Isaac's Storm , by Erik Larson. The beauty of this Facebook challenge is that it usually introduces me to books I might not otherwise have met. Isaac's Storm is one such book. By way of further introduction, you should know that I grew up in Corpus Christi, Texas. Hurricane threats were a regular part of my childhood. Some areas of the countries are lucky enough to experience the variety of the four distinct seasons. Along the Texas coast line we experienced only three: summer, fall and hurricane. During my entire childhood we evacuated only once (to San Antonio) but it turned out to be a false threat. Still, every year the general populace would converge upon the local grocery store and empty the shelves of water and batteries "just in case." The most we ever really experienced, courtesy of a hurricane moving around in the vicinity, were high winds and a lot of rain which would inevitably flood the streets and distract everyone from schoolwork which we didn't want to do anyway. 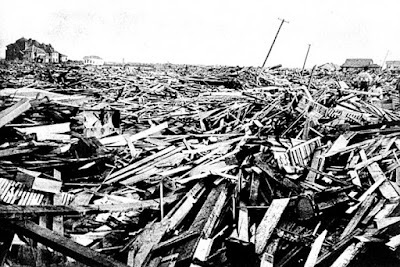 Galveston is roughly three and a half hours north of Corpus and, given its proximity, we frequently heard references about the "major hurricane" which destroyed the area at the turn of the century. 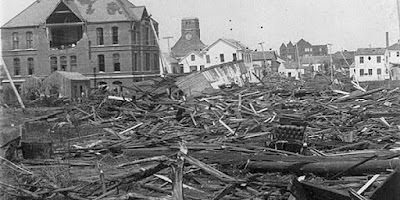 I can't confess to paying much attention to this history when I was younger, so I was glad when Sandi recommended Isaac's Storm as it gave me opportunity to finally learn in a little bit more detail what the hurricane of 1900 did to Galveston. In addition , I'd also never read a book by Erik Larson. I was glad to rectify this situation at the same time. 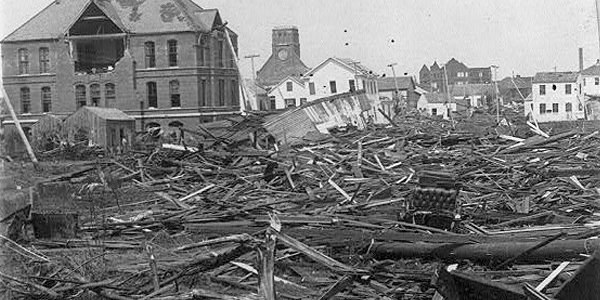 For those of you who are unaware, a fierce and particularly violent hurricane (aka, cyclone) struck Galveston on September 8, 1900. It had made an appearance in Key West, Florida a few days prior but the powers that be in Washington decreed that the hurricane was going to continue north and to the Atlantic. Storm warnings, more generic in nature, were sent along the coast but without mention of a cyclone. Isaac Cline was was the chief meteorologist in Galveston at the time. Twice a day he would head down to the beach to observe and measure the tide and the color of the sky. He would also keep watch on the barometer levels which indicated an approaching storm. (I shall make no attempt to sound remotely knowledgeable on the subject of barometric pressure. I am no scientist.) Despite my lack of scientific understanding, the story was still a pleasant read. It was fascinating to hear how scientists at the turn of the century monitored nature and made predictions based on much "cruder" instruments than scientists do these days. Unfortunately though, scientist back then - as well as those in this modern age - tend to fall prey to the same fallacy which suggests that our scientific know-how and advancements are sufficient to make us invincible against nature (and God Himself). Time and time again we discover that that simply is not the case although almost incredibly we continue to boast in our own knowledge and power. If only we would understand that we are, quite simply, no match. 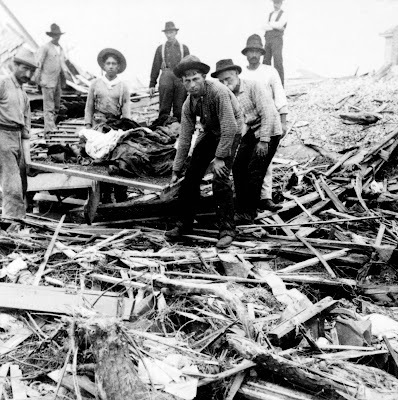 As relates to Galveston, Cline noted the marks of an approaching storm but neither he nor anyone else seemed fully aware of the destructive and violent nature of it. 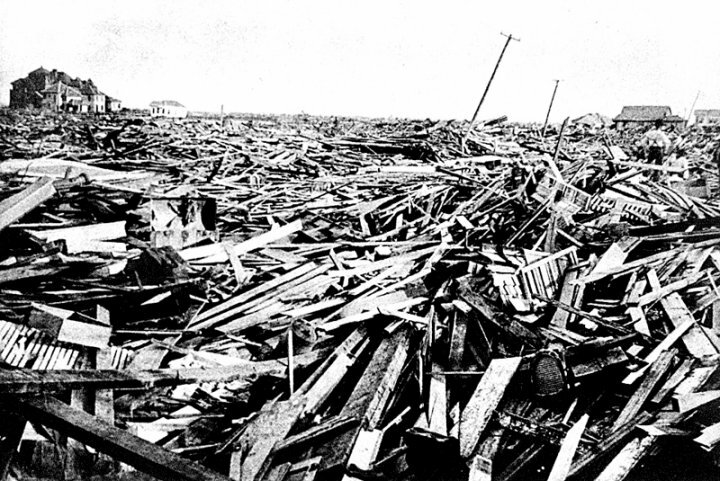 As a result, the entire town of Galveston was pretty much destroyed and its estimated that upwards of 6,000 lives were lost. In Isaac's Storm , Larson takes his readers step-by-step to the political events leading up to the storm, the telegraphs that were sent relating to this event, and the lives of the people who lived in Galveston. It is obviously that quite a bit of research went into this book. Larson clearly spent a great amount of time reading survivor accounts, tracking the careers of political figures, and becoming an amateur student of the history of weather itself! While these topics might seem boring on their face, Larson has a way of drawing his readers in and making them want to understand how and why behind this historical event. Furthermore it's interesting to get to know Cline, a man who was undeniably flawed, but who also clearly loved his work, his country, and his family very much. All in all, this book is quite a fascinating read. The only bone I have to pick with this title is a particular aspect of Larson's writing style, which is not necessarily bad, but it is somewhat distracting. Larson loves a good adjective and sprinkles them liberally about the place. His love of adjectives soon becomes quite glaring, giving the reader pause. In my opinion, he spent too much time reaching to find a clever way of phrasing something when all he really needed to do was to give the facts plainly. (I'd also have to be quick to confess that he can indeed describe a thing both beautifully and vividly. I just think he overuses this skill making it more common than I personally feel it should be, if that makes sense.) Aside from this one complaint, I found him to be a great story teller on the whole, taking a sometimes difficult and complex subject and explaining it to the reader in a way which caused things to make sense. I really did enjoy reading Isaac's Storm , despite the fact that it's about a catastrophe. Larson writes so well that this story shall stick with me for awhile. Lately I've been finishing books and setting them aside waiting for a good moment to write up a review. In the case of this book, I wanted to write out my thoughts quickly so that I could move along and try to think about something else. I think that speaks to the power Larson has to draw the reader in, causing them to both understand and feel it. To me, that's the mark of a good storyteller. I'll conclude with a song which I find to be a good reminder, especially in light of tragedy. Though so many things around me give away, God is my rock and my fortress. I cannot fall out of His hand, no matter what happens in my life. I might not understand what He's doing, but I trust Him to be at work. This is the greatest comfort. Sounds fascinating, especially having my resident meteorologist. Interestingly, this is one science that tends to keep one humble in their profession. As with all technological advances, meteorology has had some great ones since 1900 as well. But forecasters still get it wrong sometimes, and take the rap from men that God is still in control! Another book written for the young adults is "Dark Water Rising" by Marian Hale. 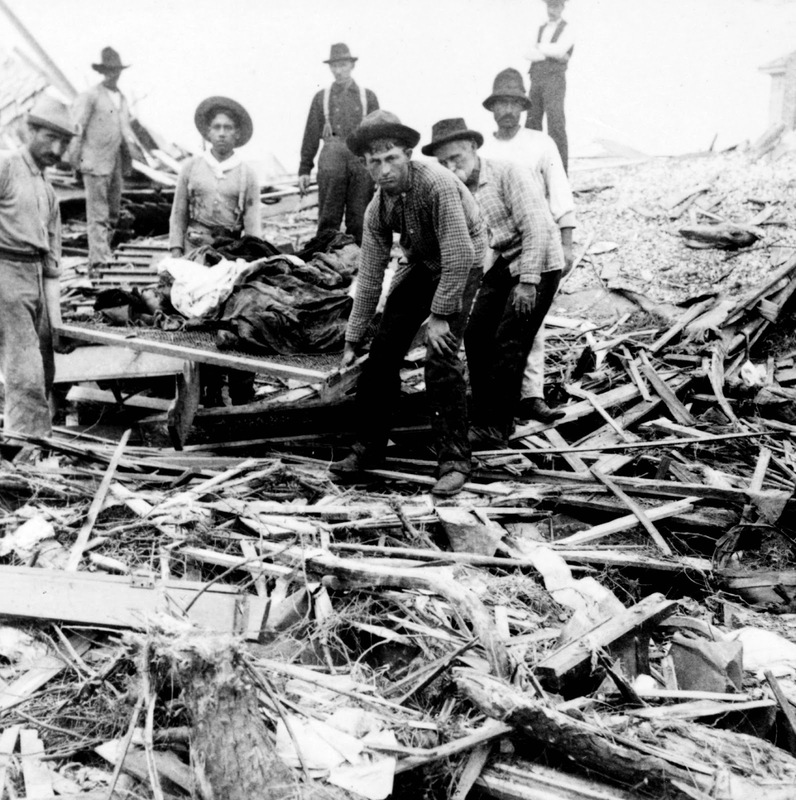 It is a well done historical fiction of that Galveston hurricane. I will add this book to my list.